THE Iberian Peninsula will experience a dry and warmer than average spring. 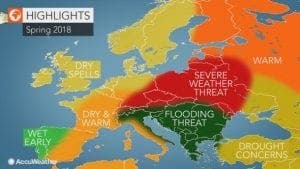 March is forecast to be the wettest period of the season, particularly across Portugal and parts of Spain ‘before a shift to very dry weather occurs from late March into May’. Infrequent storms will cause ‘unseasonable warmth to build from the Iberian Peninsula,’ the weather agency added. Eastern Spain and southern France are predicted to have the most prolonged and significant warmth. “The warm and dry weather will come at a cost as the threat for drought conditions will grow in eastern Spain and southern France,” the forecast warns. “Prolonged dry spells during spring may cause problems for agriculture due to a lack of soil moisture in areas that typically see very infrequent rainfall during the summer,” it added.